50 years after Ford Motor Co.'s first Mustang introduced Americans to the fast and affordable pony car, the automaker is counting on a new design to spur global sales. 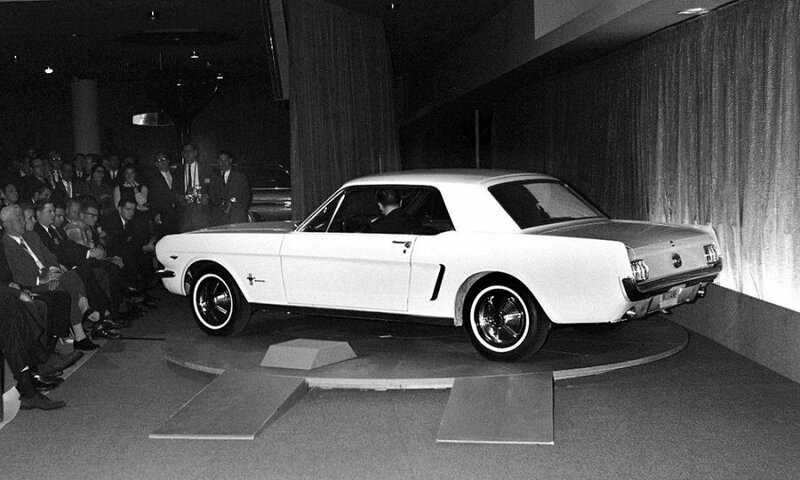 Ford introduced the new 1965 Mustang to the media in the Ford Pavilion at the 1964 World's Fair in New York. The overall Mustang program -- with a budget of $75 million -- went from concept study to prototype in record time. The first generation borrowed heavily from Ford's Fairlane and Falcon parts bins. 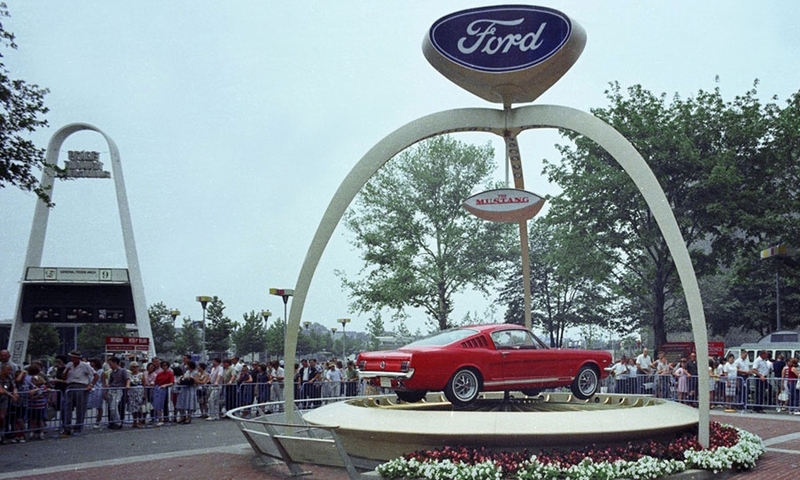 The 1965 Ford Mustang fastback on display outside the Ford Pavilion at the New York World's Fair during its debut on April 17, 1964. 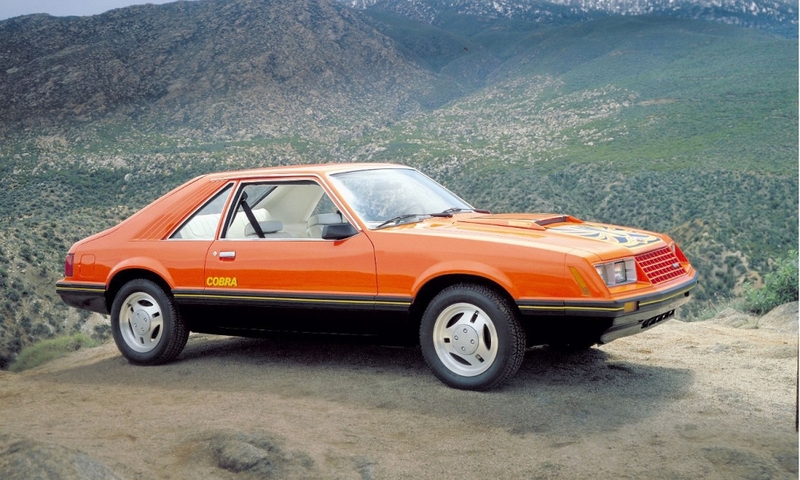 The Mustang II, based on the compact Pinto, was introduced in 1974. A brown 1976 Ford Mustang II hatchback. Under Lee Iacocca's direction, Ford asked three separate studios -- Lincoln-Mercury, Ford and a European team -- to propose designs. At the end of the competition, a design from Ford studio designer Gale Halderman was selected as the basis for the new production model. Like all the other designs, this one was named and Joe Oros, head of the Ford team, selected Cougar. Aside from the badging, the most prominent visual difference from the final production Mustang were the oval headlights from the European Ford Taunus. A Mustang photographed in January 1964 -- just a few months before it went on sale -- with a grille festooned with just the head of a Mustang. 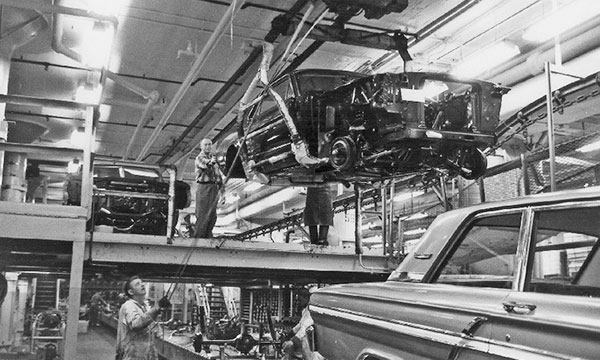 Ford began Mustang output at its Dearborn, Mich., assembly plant on March 9, 1964. By April, 3, 1964, pictured, the plant was churning out pony cars by the thousands ahead of its official April 17, 1964, introduction at the New York World's Fair. In a major public relations and marketing feat, Iacocca, head of the Ford division at the time, appeared with the Mustang on the covers of Time and Newsweek the same week the car was introduced to the public in April 1964. There had never been a retail product shown on the cover of the magazines, let alone simultaneously. 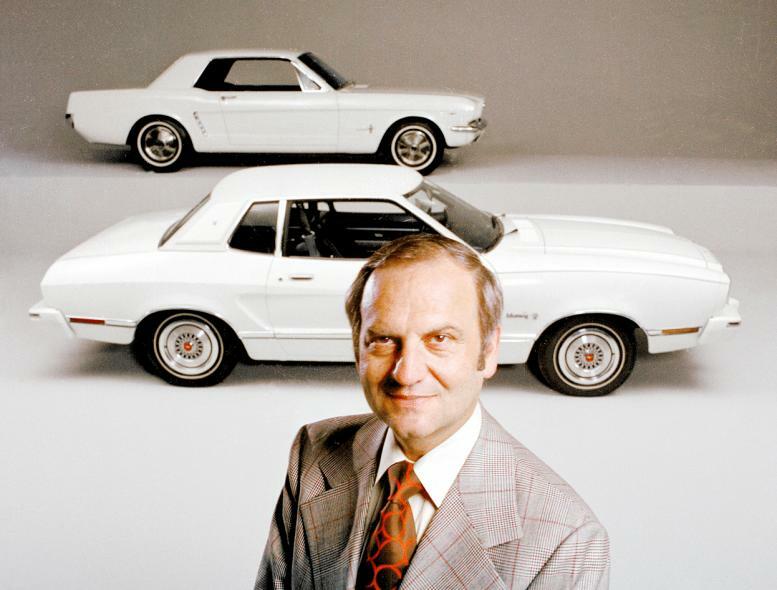 Iacocca credited the covers with an additional 100,000 Mustang sales. After its New York debut, about 124 journalists participated in the first Mustang road rally, from New York to Dearborn, Mich., with a stop at Niagara Falls along the way. 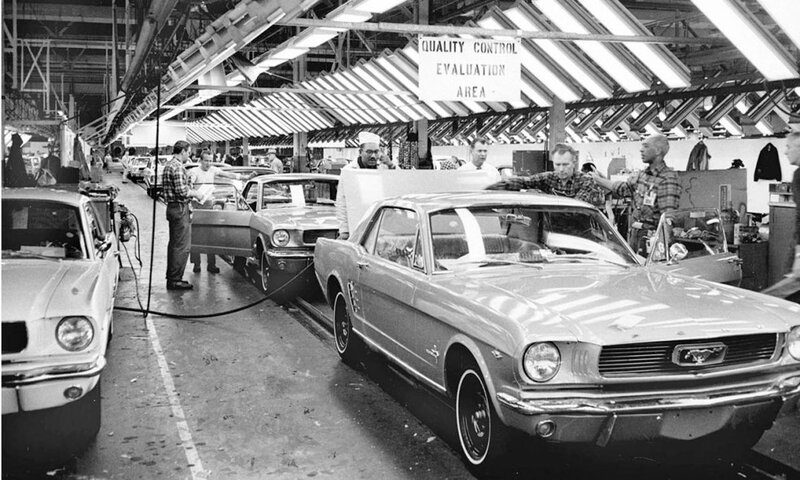 The Mustang production line at Ford's Rouge Assembly plant in Michigan in 1966, when annual output of the pony car peaked at 607,568 units. 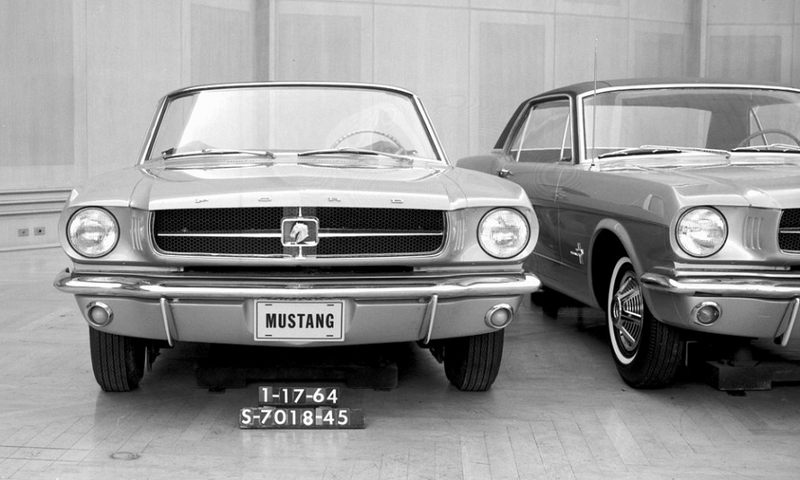 U.S. sales of the Mustang passed the 1 million mark in March 1966. 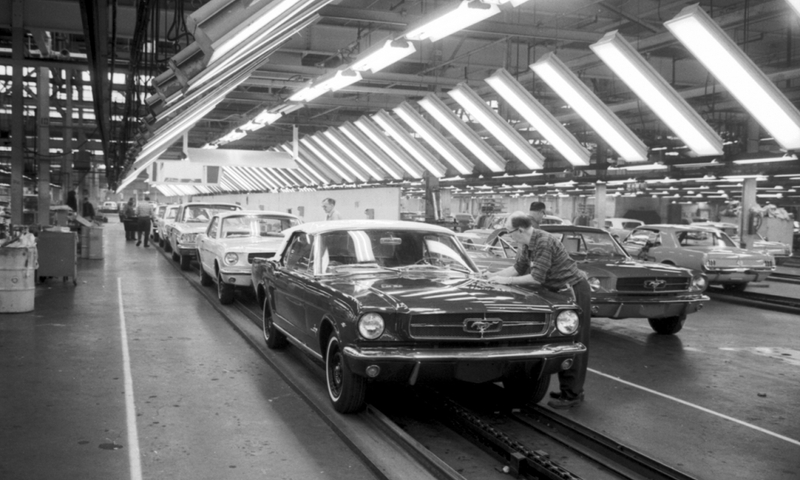 The Ford Mustang and Ford Fairlane shared the production line at Ford's Dearborn, Mich., assembly plant in 1964. But the remarkable sales success of the Mustang forced Ford to move Fairlane output by the end of 1964. 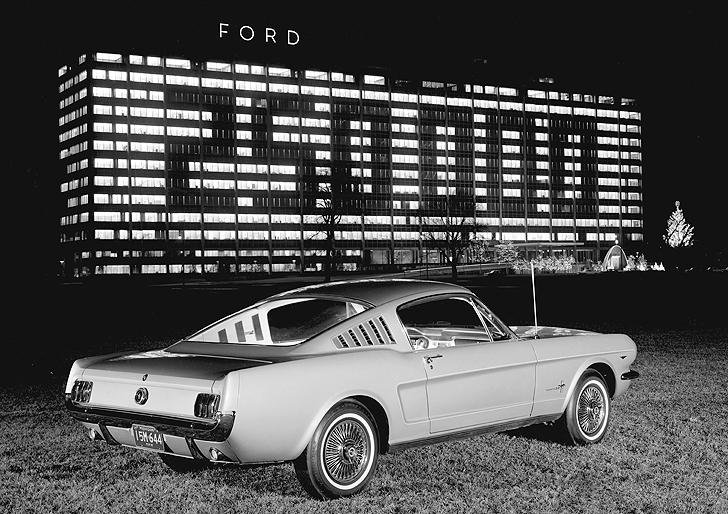 When Mustang sales reached the 250,000 mark, Ford celebrated the milestone with special lighting at its world headquarters in Dearborn, Mich.
A 1965 Ford Mustang Fastback. 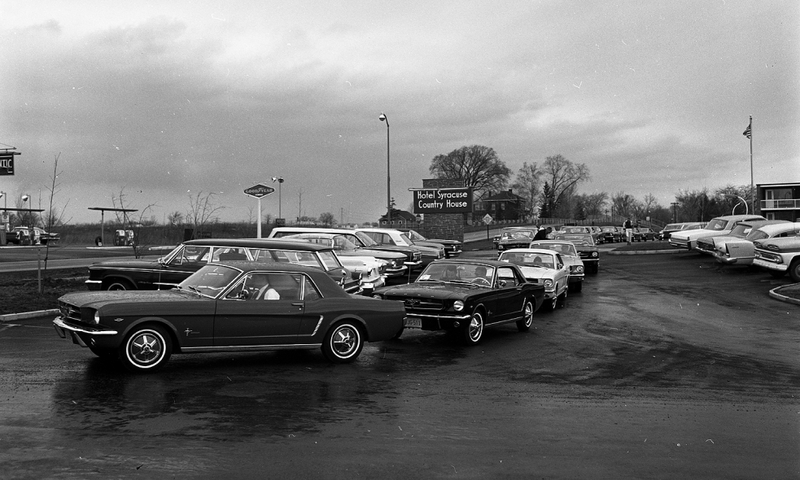 From 1964 through 1966, Ford sold 1 million Mustangs more quickly than any other car before or since. 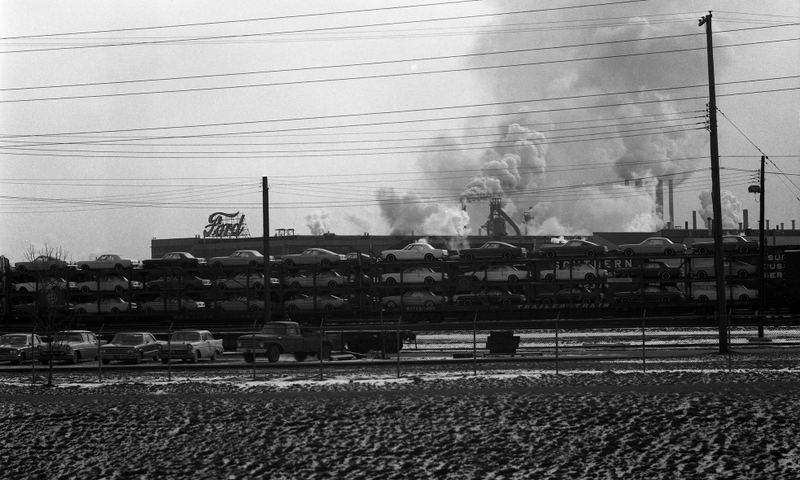 Train cars packed with the Mustang leave Ford's Rouge River manufacturing complex in Dearborn, Mich., in 1965. 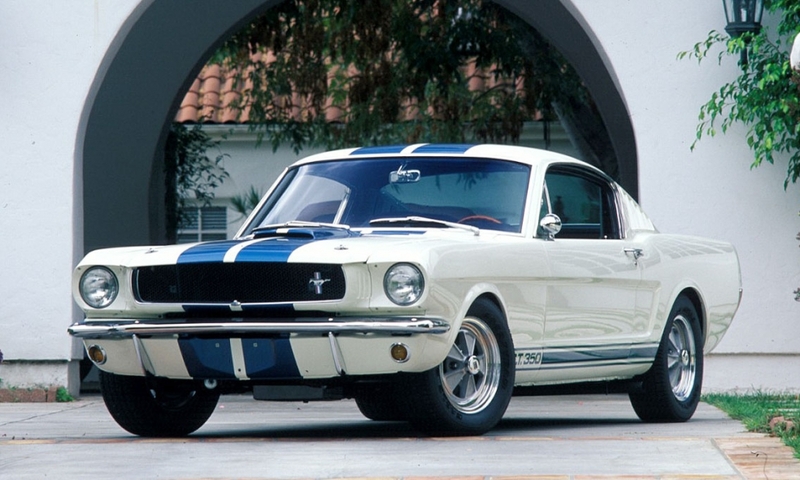 The first performance-tuned Mustang, the 1965 Shelby GT350 paved the way for all future high-performance Mustangs. Don Frey, left, Henry Ford II, middle, and Lee Iacocca, right, celebrate the Mustang's first birthday in 1965. To appeal to convertible fans, Mustang fastback models were available with "T-Top" removable glass panels starting in 1977. 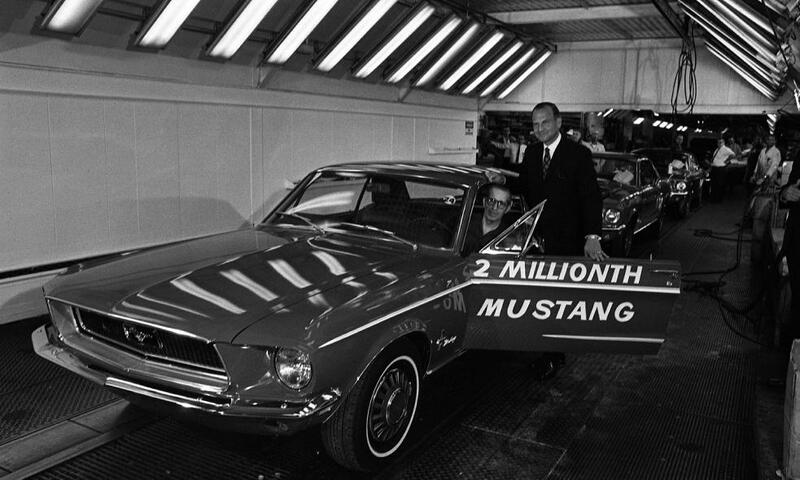 Iacocca marked production of the 2 millionth Mustang at Ford's Dearborn, Mich., assembly plant in 1968. The largest Mustangs ever -- nearly a foot longer and some 600 pounds heavier than the originals -- are introduced in 1971. The Boss 351, with its "Cleveland" block and Cobra Jet heads, is offered. The Mach 1 comes with a variety of powertrains, topped by the 429 Super Cobra Jet. 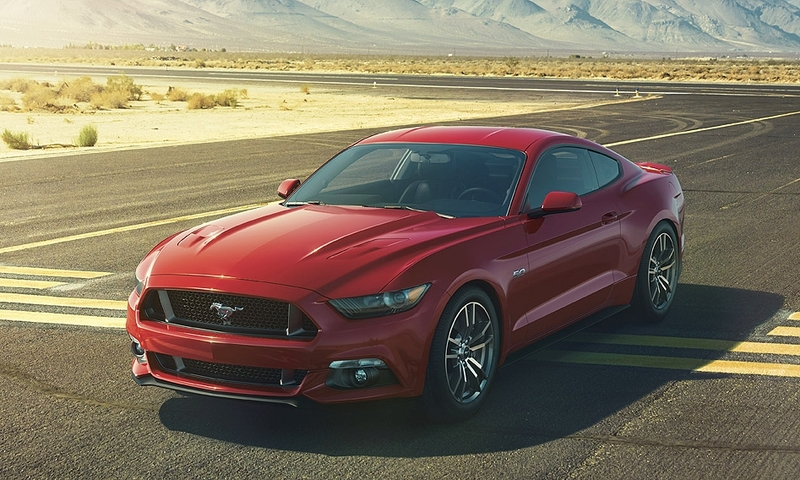 With the fifth-generation, the redesigned 2005 Mustang harkened back to the original pony cars of the 1960s. The GT convertible and other models helped give a boost to Mustang sales, which totaled 160,975 in 2005, up 24 percent from 129,858 in 2004. 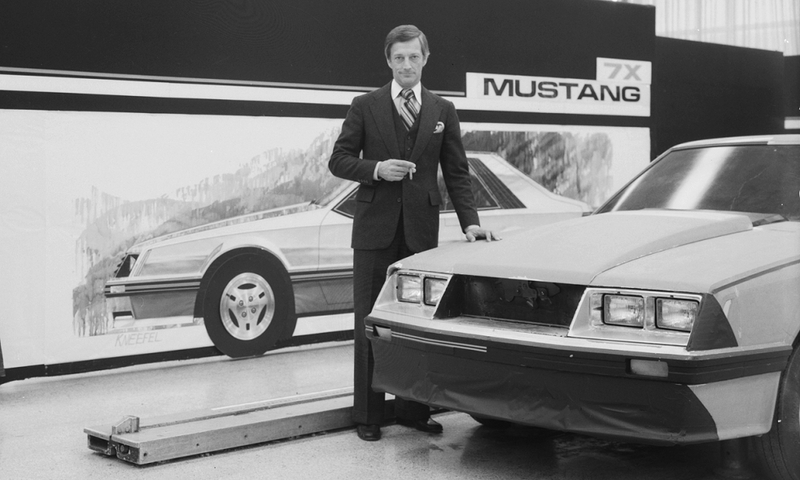 As president of Ford, Iacocca ordered a smaller, more fuel-efficient Mustang for 1974. 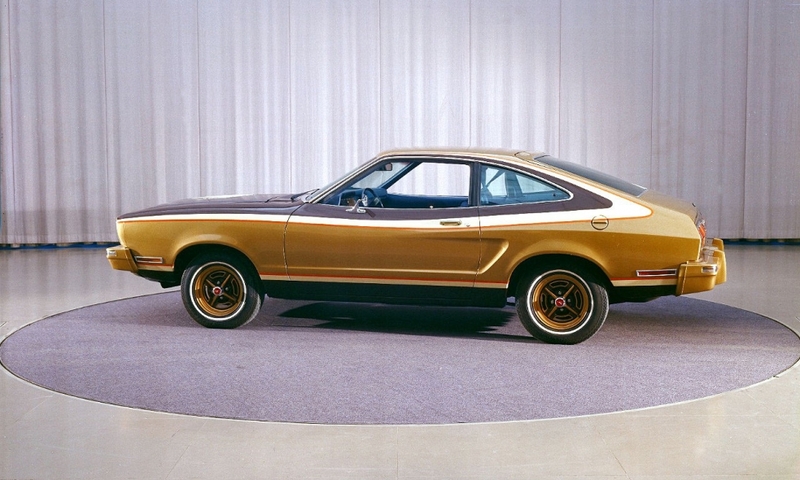 Initially it was to be based on the Ford Maverick, but ultimately was based on the subcompact Pinto. "Mustang II", was introduced two months before the first 1973 oil crisis, and its reduced size allowed it to compete against imports such as the Toyota Celica and the Ford Capri built in Germany and Britain. 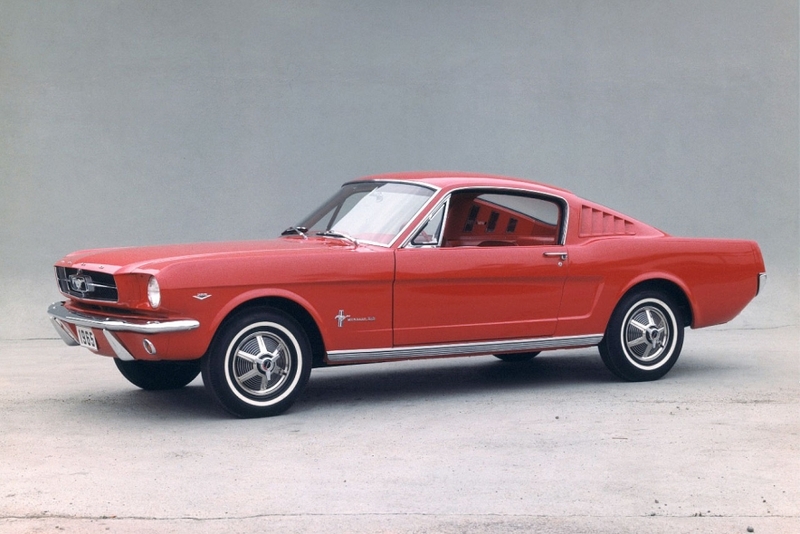 Iacocca wanted the new car, which returned the Mustang to its 1964 predecessor in size, shape, and overall styling, to be finished to a high standard, saying it should be "a little jewel." 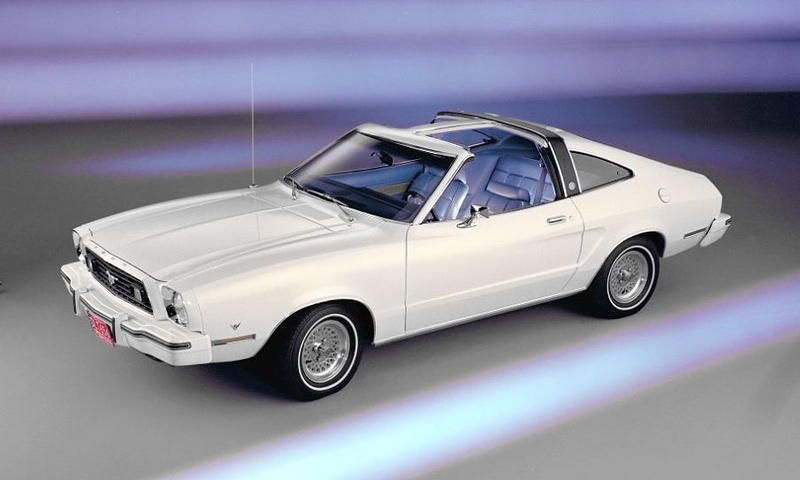 For a 1979 redesign that heralded sleeker, Euro styling, the Mustang switched to Ford's Fox platform and offered multiple engine choices: a four cylinder, a turbo four-cylinder, I6's, V-6 and V-8 engines. It is longer and taller -- yet 200 pounds lighter -- than Mustang II. 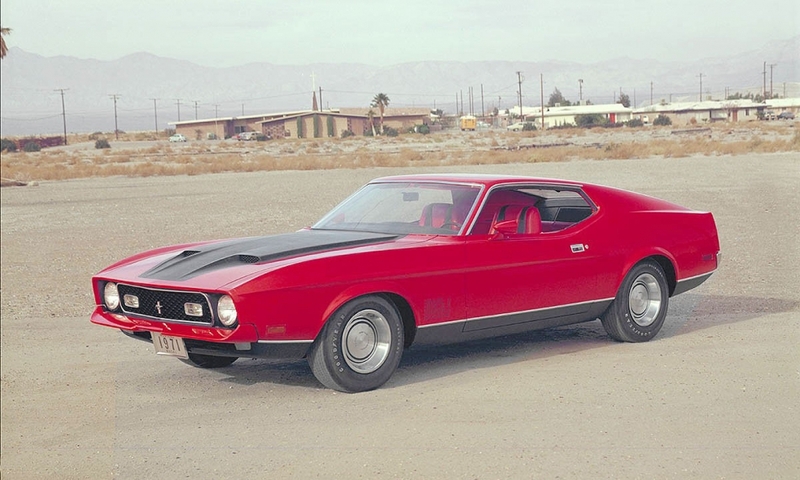 “Thou shall never do a slantback front end.” That was the house rule from Gene Bordinat, Ford's longtime head of design, as planning for the third-generation Mustang got under way in the mid-1970s. “Henry Ford II only wants vertical front ends, and he'll show us the door if we ever try anything like” a slantback. 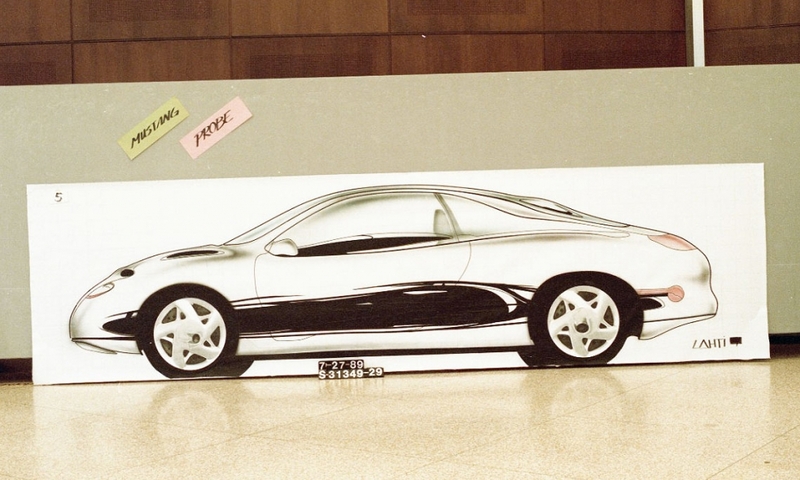 But the final design — championed by Jack Telnack, pictured, who had returned to Dearborn from a stint as head of design for Ford of Europe, resulted in a slantback front and a lean, 2,700-pound curb weight and improved outward visibility. 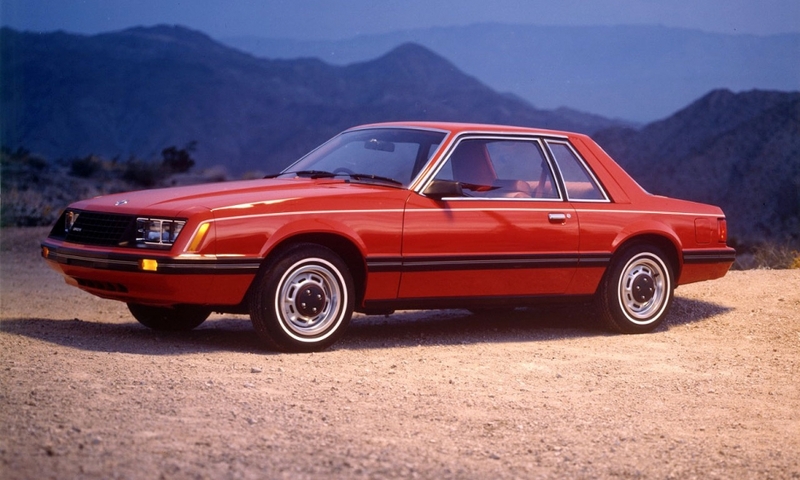 The 1979 Mustang's new European-influenced shape was Ford's first serious stab at reducing air resistance with the lowest drag coefficient on the road at the time — 0.44 for the fastback and 0.46 for the notchback. 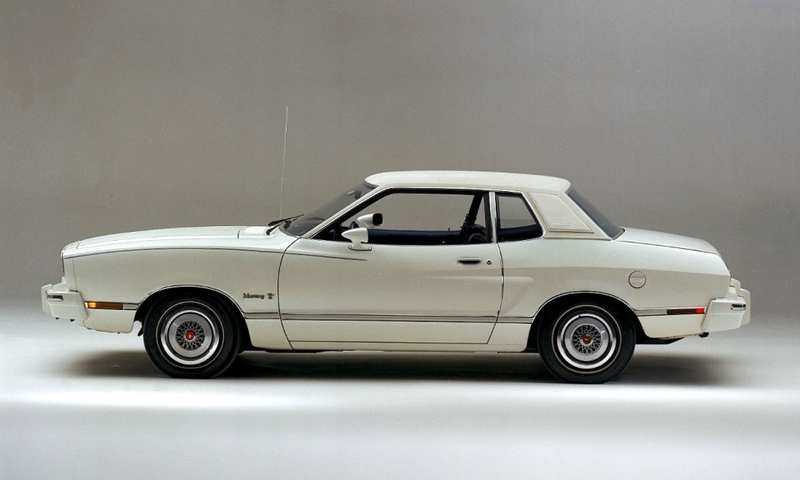 With the 1980 Mustang LX Coupe, Ford dropped the 302-cid V-8 engine and replaced it with an economy-minded 119-horsepower, 255-cid derivative of the company's “Windsor” small-block V-8. 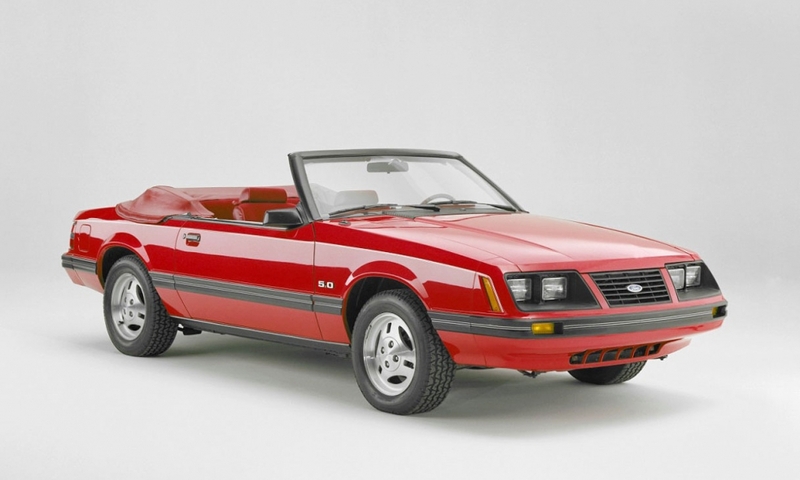 After a ten-year hiatus, Mustang is offered in a convertible beginning in 1983, with a power top and tempered rear glass window. In 1986, Ford retired the Mustang V-8's carburetor for new sequential multi-port fuel injection. It was also the last year for four-eyed headlights. 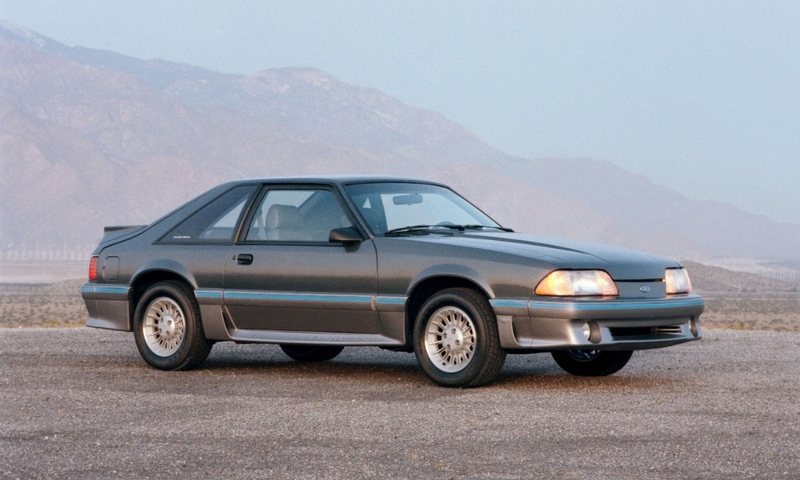 Mustang is restyled for 1987 with a new “aero” body and headlamps. 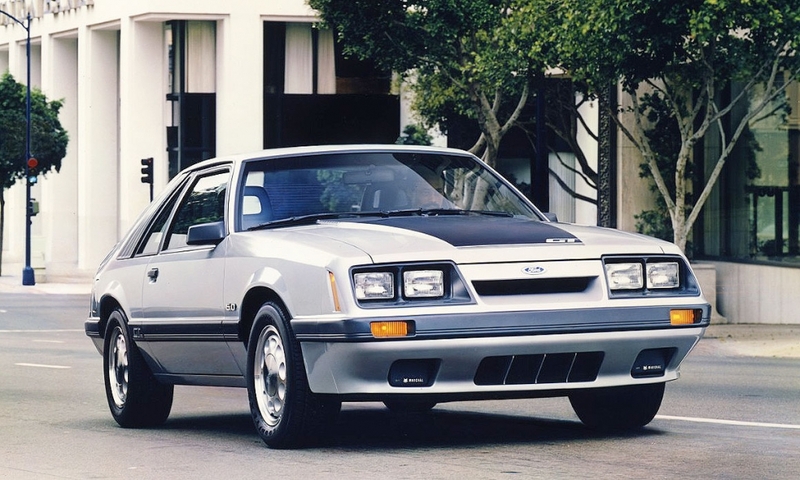 In the early 1990s, Ford considered a Japanese-inspired, front-wheel drive Mustang that later became the Probe after pony car enthusiasts protested. 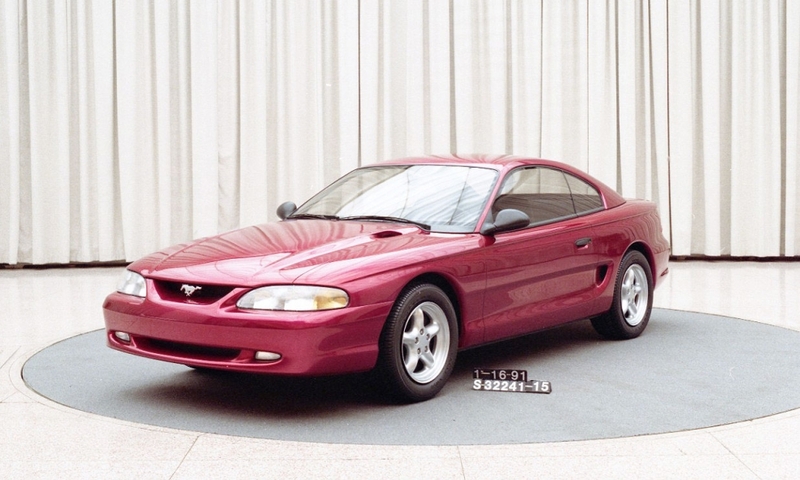 The jellybean styling on this front-wheel drive concept is curiously reminiscent of the Mustang Mach III Concept that would debut as a preview of the "SN-95" design direction in 1992. Also important to note in this frame is the labels of both “Mustang” and “Probe” on the wall. For its 30th anniversary, the Mustang is dramatically restyled to evoke the car's heritage and performance tradition. 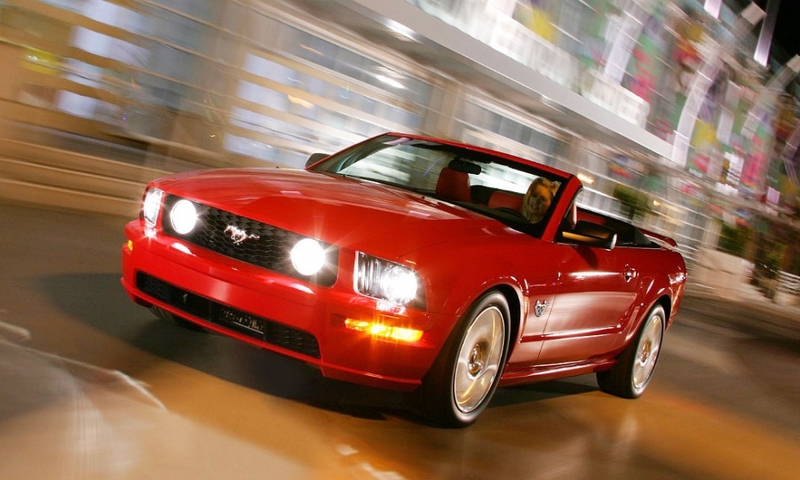 It's the first major redesign in 15 years and 1,330 of the pony car's 1,850 parts are changed. 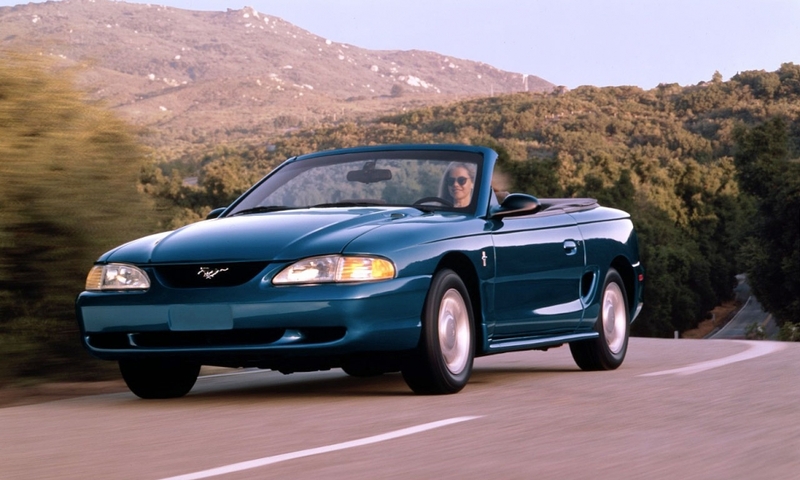 The Ford Mustang convertible in 1995, when Ford's venerable 5.0-liter V-8 spent its final model year in the car. Ford's SVT unit produced 250 Cobra R models powered by a 300-horsepower, 351 cid V-8. In 1996, for the first time, Mustang GTs and SVT Mustang Cobras are equipped with Ford's new 4.6-liter "modular" V-8 engine, which uses overhead cams to open the intake and exhaust valves. 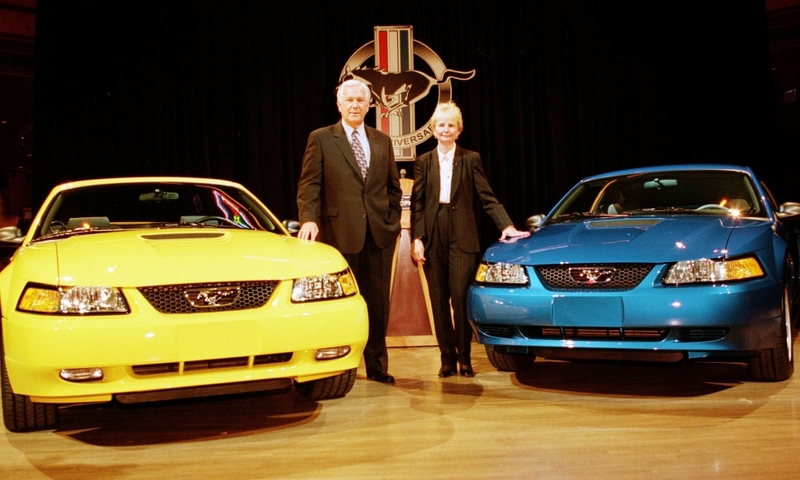 Jim O'Connor, left, head of the Ford division, and Janine Bay, the first female chief program engineer for the Mustang, introduced the 1999 model. 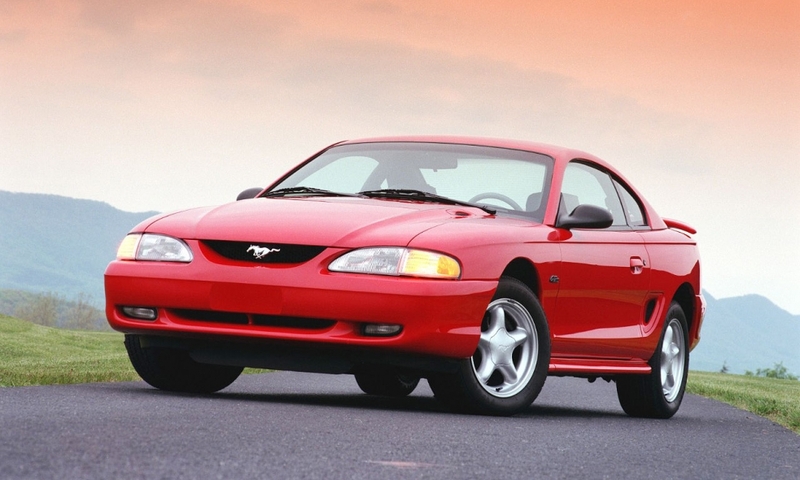 Classic styling cues on the refreshed 1999 included a long hood and short deck, a prominent hood scoop, triangular-shaped side scoops and Mustang's signature tribar taillamps. The galloping pony centered on the grille was surrounded by a chrome corral, as it was on the original Mustang. 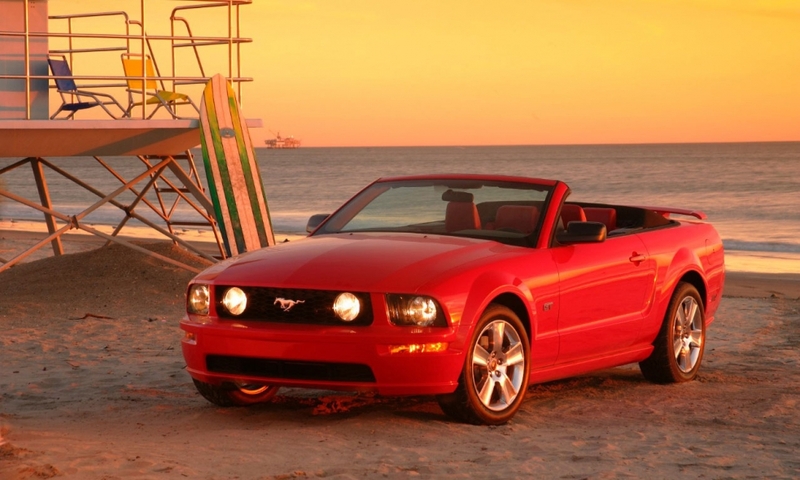 In 2004, Ford produced its 300 millionth car -- a 2004 Mustang GT convertible 40th anniversary edition. 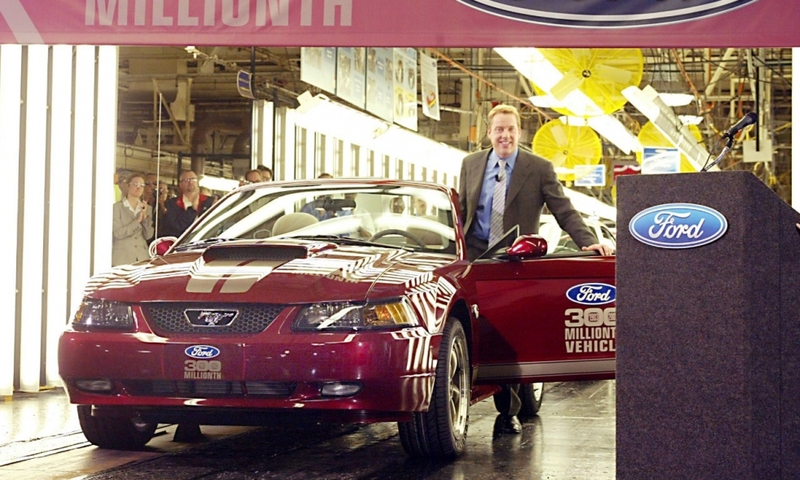 The 2004 Mustang was the last car built at Ford's fabled Dearborn assembly plant in Michigan, where every Mustang model since the car's inception had been built. The Mustang's 45th anniversary is celebrated on April 17, 2009, in Birmingham, Ala. But U.S. Mustang sales in 2009 hit an all-time low of 66,623, reflecting the industry's broad downturn and competition from the revived Chevrolet Camaro and Dodge Challenger. 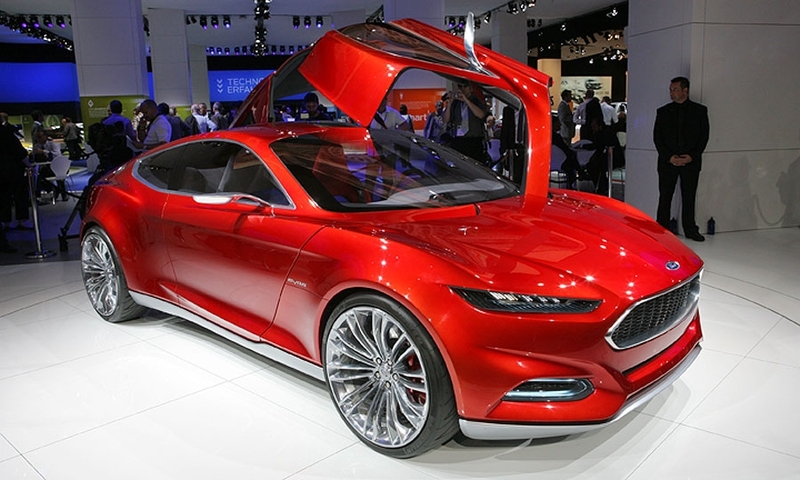 Ford hinted at the next-generation Mustang with the Evos concept introduced at the Frankfurt Motor Show in Germany in September 2011. The 2015 Ford Mustang -- shorter, lower and wider than the outgoing model -- goes on sale in the last quarter of 2014 with more standard equipment.